The Second Epoch started in Babylon several thousand years ago and is now in its biggest and best (maybe last) Golden Age that will eventually it’ll crumble into a dark age. Whether that collapse happens a few decades from now, or in a few centuries or in a few millennia, probably depends on the choices we humans make. Not just big choices made by people in power… choices that lead to climate change, rising sea levels, weapons technology, overpopulation, or drug abuse spreading around the globe. But especially the little, personal choices, noble or savage, that we all make as we walk the Earth and interact with each other. Noble choices inspired by honesty, love, trust, decency, and desire to serve others, all help to enhance, strengthen, and advance the Golden Age. Savage choices provoked by deception, fear, suspicion, selfishness, and desire to acquire more-more-more, all stress the foundation of world civilization and cause the entire structure to decay from within, bringing us ever closer to the dark age. We’ve all got a part in it. We’ll start our exploration of life in the Second Epoch with that last item on the list. In the big, cosmic picture, the lives of us humans today are fleeting. Ethereal beings have timeless lives spanning many millions of our years. When we die and awaken in level 3, we might enjoy a casual life in paradise while a thousand years pass by quickly on Earth. Hindus think of a Day of Brahma (God) as 4.3 billion years. We humans, by comparison, are lucky to live 100 years. 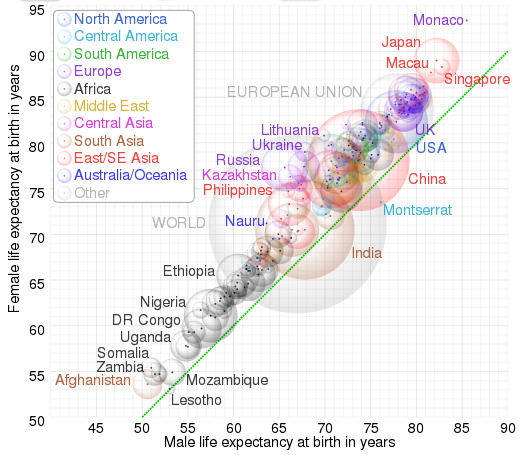 If you have a few minutes and an inclination to ponder on population and life expectancy in today’s world, click on this picture to open an interactive diagram (very well done by Cmglee). The first of two life tasks: 1) building a container or identity by strengthening the ego, then 2) filling the container with life experiences, whether nobly or savagely. The first stage-and-a-half of a 3-stage journeyfrom 1) order (being loved and protected) to 2) disorder (as we go out into the unruly world), then finally to 3) reorder(as we detach from worldly dramas in preparation of moving on). Other unknown forces, [which I’ve come to believe are mostly spiritual (about 40 percent)]. Here’s a simple chart that shows some of the main influences on us growing up. These are just ballpark percentages. They’re not based on hard data from any particular study. I created them with artistic license and gut feeling after reading a lot of articles on line… while trying to get an objective view of those forces that shape our attitudes, intelligence, personality, and beliefs… especially during our impressionable years. I explored this in another article, so the following is just a summary. Modern experts often refer to four parenting styles that can help shape their kids’ attitudes and futures. Here are those styles, along with some common terms we often use to describe them. Four parenting styles are often cited for shaping kids’ attitudes and behavior in distinct ways. The bottom row contains terms I often use. Savage child-rearing would probably work best if we lived in a purely savage, dog-eat-dog world. 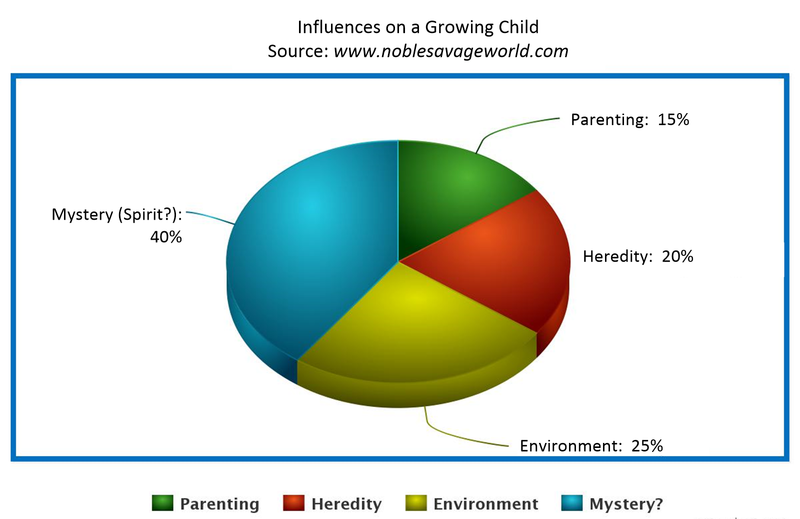 Noble child-rearing would probably work best in a paradise world in which love, trust, good will, and moderation were a universal way of life. The “authoritative” approach seems best suited for this noble-savage Earth. It’s easy for parents to take findings like these too much to heart. Especially if their young children or grown children are having problems, it’s easy for parents to blame themselves. Fortunately, more comprehensive studies that consider environment, genetics, and other factors lift most the burden from parents’ shoulders. Turns out, their parenting didn’t have all that much to do with it. Imagine a river that has a factory dumping chemical wastes into the water. Fish upstream of the factory are healthy and normal, while fish swimming downstream are exposed perpetually to the chemicals. Downstream, the fish hatch, live, and die in a toxic environment. Toxic living is all they know. They have cancer and other diseases, and if we could psychoanalyze them we’d probably find them stressed, depressed and frustrated. Overpopulation and its resulting famine and disease. Poverty in urban communities of unattached, testosterone-driven men and broken homes. Widespread alcohol and drug use, foul language, promiscuous behavior, and violence… and popular media that glorify them. A nomadic (for example, military) childhood in which kids have to adjust to new peer groups wherever they move, always starting at the bottom of the pecking order. Heredity can play a big role in these human qualities… but there seems to be something even bigger at work behind the scenes. Think about your own siblings and siblings in other families. How similar or different are they. While the qualities listed above are largely inherited, they’re not often distributed evenly among siblings. There’s something else at work here. While these qualities are somewhat inheritable, studies have found that about half of the differences in personality, intelligence, and behavior come from something beyond genetics… something in our around our world that the experts cannot figure out.